Human performers have developed impressive acrobatic techniques that never fail to draw gasps, blinks and open-mouthed children. They watch a body swing through the air and in the process even twist and flip. Can robots really be expected to pick up the art of acrobatics? Researchers at Disney Research revealed a study that leaves no doubt they can. 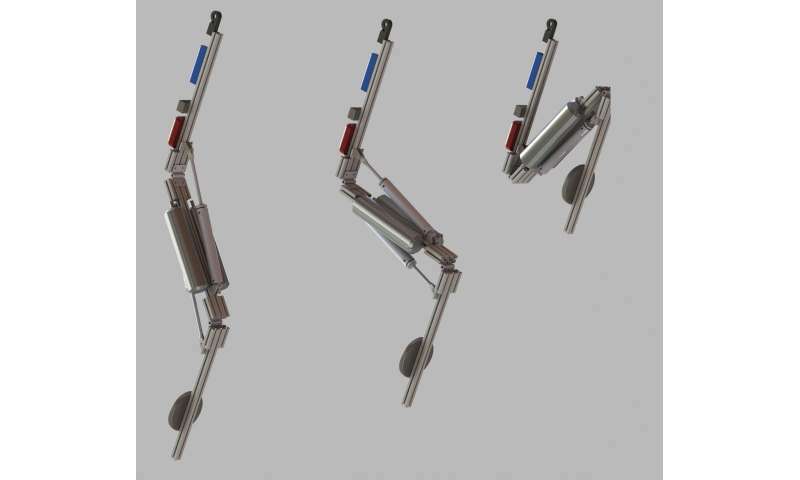 A six-person team affiliated with Disney Research, in Glendale, California, have presented their work on "Stickman: Towards a Human Scale Acrobatic Robot." A video also shows Stickman in action. Morgan Pope, Steven Christensen, David Christensen, Anthony Simeonov, Grant Imahara and Gunter Niemeyer said that this is a simple two degree of freedom robot. It uses a gravity-driven pendulum launch and produces somersaulting stunts. For instance? Stickman swings through the air on a pendulum. Stickman "tucks" to change its moment of inertia, releases, "untucks" to reduce its spin, and can gracefully land on its back on a foam mat. CNET noted that its stunts include "a single backflip, a double backflip and a graceful free-fall." Stickman consists of three aluminum links connected by hinges. This design allows it to transition from a collapsed "Z" to an approximately straight line. (The links can fold or unfold to tuck or untuck during a somersault.) Air tanks store the energy used for actuation. A 12v lithium polymer battery pack powers solenoid valves controlling actuators. The Verge had more details: Inertial motion sensing, a trio of laser range finders, and computer vision enable Stickman to pull off the stunts, and ensure its safety by landing on a mat. Why the research matters: First, there are the obvious talking points about robot design and control. There is the obvious interest in making a robot human-like athletic skills. Jon Fingas in Engadget posed the thought of the work having implications "beyond putting on a show for a human audience." Fingas said, "It could help robots overcome obstacles that most people would consider impassable, and help them survive landings when they fall from great heights," a maneuverability that "could prove a lifesaver in rescue situations." Also, there is the bidirectional interplay concerning not only humans inspiring the movements of a robot but also a robot that can teach humans. The authors said, "a robotic acrobat can help answer questions about how stunts are performed in ways that may be of use to elite gymnasts." Studying humans for such a purpose has its limitations. For example, researchers may seek to investigate the physics involved in a given stunt. The inertia of the human can only be approximated, as disassembly for measuring each limb is infeasible, said the study authors. Second, a performer who attempts to make a specific change to the approach to a stunt might inadvertently change many variables. Next, performer joint angles must be approximated from video, and many human joints lack a fixed center of rotation relative to the limbs. "A robotic performer is not inherently subject to these limitations, and so is an effective tool for exploring specific strategies of locomotion." Stefan Etienne, The Verge, commented: "It's not much now, but the possibility of robot gymnastics and parkour is, in fact, becoming a reality. After all, Boston Dynamics' humanoid robot performed a successful backflip last year."